MEXICO CITY -- The leaders of Canada and Mexico say they're not walking away from NAFTA talks in the wake of the latest aggressive proposal from the United States. Both Prime Minister Justin Trudeau and Mexican President Enrique Pena Nieto said the proposal — a sunset clause on any new North American Free Trade Agreement — remains just that, an idea. "We will continue to take very seriously the work we do and we will not be walking away from the table based on proposals put forward," Trudeau said at a joint news conference with Pena Nieto in Mexico City's stately National Palace late Thursday evening. "We will discuss those proposals, we will counter those proposals and we will take seriously these negotiations." Negotiations for a revamped NAFTA are now in their fourth round and the U.S. sunset clause idea is the latest in a series of moves that have frustrated Canadian and Mexican negotiators. More challenges lie ahead — rules for auto parts could come as early as Friday. An original suggestion from the U.S. that American and regional content levels be beefed up has already drawn condemnation. Trudeau and Pena Nieto talked with their aides and then their foreign affairs and trade teams for close to two hours Thursday afternoon. 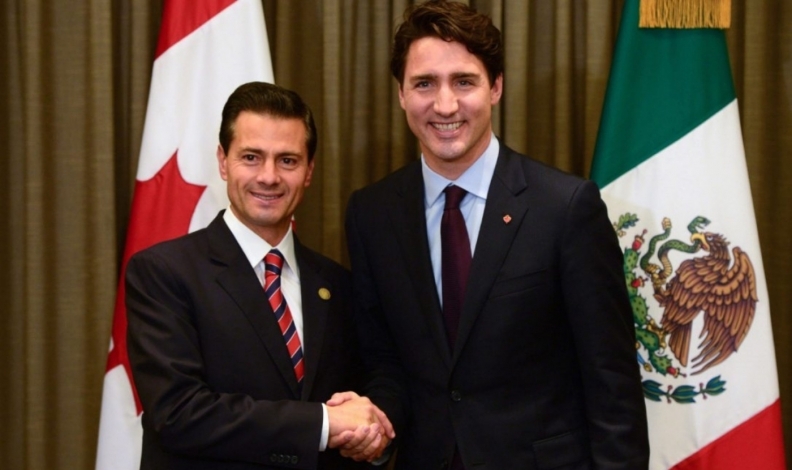 Trudeau's visit is his first official trip to Mexico and follows Pena Nieto's trip to Canada in June 2016. While the two sides were discussing a range of issues, the ongoing talks to rework NAFTA were a large part of the discussion. Pena Nieto suggested that while observers have made predictions that certain proposals could tank the talks, that's only speculation. "I would not pay much attention to any statements other than that which happens [at] the negotiation tables," he said, according to an English translation of his remarks. Pena Nieto indicated he was paying attention to a suggestion from U.S. President Donald Trump on Wednesday that should NAFTA talks fail, bilateral deals could be negotiated instead. Afterwards, Trudeau didn't rule out the notion, and Pena Nieto said he did discuss it with the prime minister Thursday. But he said he also heard Trump say that the three countries could find a creative way to negotiate a new trilateral pact. "I think that Canada and Mexico share the idea that the NAFTA agreement is a good mechanism, it's not the only one but it's a good mechanism to potentialize the development of the North American region and to turn it into the most competitive one."